Several of my friends have asked me lately how I can be so positive that CO2 is not the evil, planet-killing pollutant that the science community insists that it is. This missive is a partial response to those friends. I will have more to add, likely some figures, charts, graphs, links to other sites and such. But, here is the first effort. Fair warning: this is a long, long piece. It covers a lot of ground. It is as accurate as I can make it. I haven't delved into the "why", but concentrated on the "what" and some of the "how." There are a few "whos" in here, also. Most of this has been covered by me in one or several earlier posts on SLB. Scientists said CO2 emissions are heating the Earth, with dire, even catastrophic consequences about to happen: ice caps melt, sea level rise, shores inundated, massive very strong hurricanes and more of them, heat waves with deadly tropical diseases moving into temperate zones, crop failures due to heat and desertification, human health pandemics from heat-aggravated issues, snow disappearing from the California Sierra Nevada range, fresh water shortages, the list went on and on. My interest was piqued, to say the least. The Earth is becoming un-inhabitable? Millions of climate refugees would be on the move, seeking places to live? Wars would be fought over food, and fresh water? Coastlines would flood and be gone forever? And this is all due to our fossil fuel use? My industry? The oil and gas industry? I knew that chemical engineers would be involved, and in the thick of it, too. Chemical engineers are the ones that know how to provide substitutes for oil, for diesel, make ethanol from corn or cellulose. Chemical engineers also are the ones that know how to design, build, and operate a CO2-capture plant, and find ways to either chemically bond the dangerous CO2 or find ways to permanently store it underground as part of that sequestration. So, I began to look into what chemical engineers could do to solve the problem, and seek ways to benefit from my chemical engineering background, and legal expertise as an attorney. Surely, there would be some opportunities in all this for a guy with my skills. I had to do my due diligence, and verify the scientific claims. First, just how does CO2 cause all this warming? I had worked with CO2 for decades, in many forms and many places. CO2 is a combustion product (along with water vapor) from burning natural gas, other light hydrocarbons, gasoline, diesel, fuel oil, petroleum coke, wood, coal, even peat and dried animal dung. I knew more than most, I supposed. I had designed and installed and operated liquid CO2 storage tanks, equipment to gasify liquid CO2, to compress it, to re-liquefy the compressed gas. I had also designed and operated process equipment to scrub CO2 out of a furnace’s flue gases, and designed and operated other process equipment that made solid particles out of the CO2. I figured there would be lots of opportunities for me. Finding out how much CO2 needed to be removed seemed like a good place to start. I began by reading blog posts on a website called RealClimate.org, where they claimed “real climate science written by real climate scientists.” That seemed like a good thing, to get the information right from the experts. I saw there some charts and graphs, and I understand charts and graphs. Chemical engineers know all about such things. One of those graphs showed the earth’s global average temperature since about 1880 up until 2005. There was a dramatic and noticeable upward trend from around 1975 until the present. That trend, if it continued, would certainly appear to make the world hotter, and indeed, perhaps the ice caps would all melt. So, being a good engineer, and a lawyer trained to look at all sides of the issue, I looked at the rest of the chart. It looked a bit odd, to me. You see, there was a rather flat area from around 1940 to 1975, or perhaps even a slight downward trend in those 35 years. Hmmm…I wonder what caused that? Perhaps CO2 was going down in that period? Made a note to check that out. Then, the period before 1940 really caught my eye. From about 1900 to 1940, the graph showed a remarkably similar upward trend, just like the one from 1975 to 2005. Hmmmm, again…how did that warming trend happen? Was CO2 rising in those days? And if it was, why did it stop around 1940? The world was in a global war in the late 30s and first half of the 40s….did we not use any coal, or oil, or natural gas in those days? Something seemed not quite right about that, as I distinctly remember from my reading about the oil industry that oil production rose dramatically during World War II, due to all the military machines that needed gasoline and diesel fuel, and the ships that needed fuel oil to run. I knew that atomic power was not around until well after the war, so all those ships were running on heavy fuel oil, what we referred to as Bunker C oil. Also, factories across the world were humming at full capacity before and during World War II, turning out munitions, steel, aluminum, war machines, tanks, jeeps, ships, and all the other trappings of war. Not much conservation going on there, I thought. Lots of CO2 being emitted, too. Nobody cared about efficiencies or conservation, or even pollution, the only thought was for more production as fast as possible. There was a war on, after all. I then looked into the amount of CO2 in the atmosphere, thinking it was some great percent, probably 3 or 4 or maybe 5 percent. The graphs I found looked wrong, at first. The CO2 was nowhere near 5 percent. Not even 1 percent. It was so low it was measured in parts per million! About 365 ppm (parts per million), I found, and increasing by about 2 ppm per year. The measurements went back to 1959, and even more amazing to me, this 365 ppm was on a bone-dry basis. That means, the air sample was desiccated, or dried very thoroughly to remove any water vapor before quantifying the CO2 amount. That is actually a good practice, because it eliminates any variations due to changes in air humidity. But on a practical basis, if the atmosphere contains very much water vapor, then the actual CO2 concentration will be somewhat less. I worked it out, and for air in the tropics at 80 degrees F and 90 percent humidity, air contains about 0.2 pounds of water per pound of dry air. Roughly, 17 percent of the air we breathe in is water vapor. That, then, would reduce the CO2 concentration also by 17 percent, so that 365 ppm was actually about 310 ppm. Wow. Could CO2 at 310 ppm be causing all that trouble? I had to see how this worked. It didn’t take me long, looking around on the internet to find that scientists were claiming that CO2 absorbs heat from the Earth’s surface, and re-radiates about half of that heat back down to Earth. The effect was termed the “greenhouse” effect, and CO2 was labeled a “greenhouse” gas. Hmmm…that’s not how greenhouses work, I knew, because we had designed and built greenhouses, too. Greenhouses stay warm just like a car stays warm when the windows are rolled up. Heat from the sun passes through the glass, is absorbed by the dark green plants, and heats up the air inside the greenhouse. Winds cannot blow the warm air away because the glass walls and roof are present. In engineering terms, there is no convection heat transfer. Well, this “greenhouse” gas may be a term of art, and I have certainly encountered many such terms of art in engineering, and in the law. More investigation was clearly needed. So, I found the Kyoto Protocol, which had a lot to say about greenhouse gases. Turns out, there are six of them, not just CO2. The Kyoto Six included CO2 of course, plus methane, nitrous oxide, sulfur hexafluoride, hydrofluorocarbons, and perfluorocarbons. Then, how did the CO2 and others absorb heat and re-radiate it back to Earth? And, how did that create a warming? Some things already did not add up, such as increasing CO2 since 1959 but the temperature cooling from 1940 to 1975. More on that, later. More investigation led me to Anthony Watts’ blog, Watts Up With That. It appeared to be a place where articles were posted that questioned the orthodoxy of man-made, CO2-caused global warming. So, I read and read about Al Gore and his movie An Inconvenient Truth, Dr. James Hansen of NASA who creates the world’s temperature chart, and several other figures. There was something called “The Team” and I did not know who was on the team, and what game they played. From the context, though, being a member of The Team seemed like not a good thing, as the term was used somewhat disparagingly. But, back to CO2 and heating the Earth. I read about CO2 absorbing heat. Some small bells went off way deep in my memory. I had heard about this somewhere, a long time ago. I pulled out my ancient handbook of Chemical Engineering, known as Perry’s Handbook. That book is full of rock-solid, never-wrong science and engineering facts. If it was in Perry’s, it was a fact. It could be relied upon. Chemical engineers use the principles and knowledge found in Perry’s every day, around the world. So, I looked in Perry’s. And I found it. Under Heat Transfer, sub-heading Radiative Heat Transfer, furnace design. Furnaces usually burn some form of fossil fuel, perhaps coal, or oil, or natural gas, or a mixture of light hydrocarbons if the furnace is in an oil refinery. Home heating furnaces burn a medium oil similar to diesel fuel, and there are millions of these around the world. There are a similar number of large, industrial furnaces and boilers in power plants, factories, steel mills, refineries, and chemical plants. Furnace design is a very mature art, having been practiced and perfected over not just decades, but centuries. Even railroad locomotives burned wood or coal, and have done so for centuries. And, sure enough, one of the correction factors that must be included in the furnace design is the effect of CO2 in the combustion gases. Water vapor also must be accounted for, and its effect is even greater than that of CO2. A bit of an aside is in order, here. When a fossil fuel is burned, a chemical reaction occurs that gives off a great quantity of heat. A fossil fuel is a hydrocarbon, meaning most of the molecules are either hydrogen, or carbon. Hence, Hydro-Carbon. Chemists are not very inventive when naming things, sometimes. Air is added, and heat, and the oxygen in the air reacts chemically with the carbon, and with the hydrogen. One carbon atom combines with two oxygen atoms in the air, to form CO2, Carbon Dioxide – meaning one Carbon, and two Oxygens. Again, not very creative naming. Similarly, two Hydrogen atoms react with one oxygen atom to form H2O, Di-hydrogen Monoxide, more commonly known as Water. The water is in the gaseous state, so it is water vapor. This is important in furnace design, because what flows out of a furnace’s exhaust stack is mostly nitrogen from the air fed into the furnace, very little oxygen because most of it is reacted, and the rest is water vapor and CO2. How much CO2, and how much water vapor? Is the CO2 a very low concentration, like that in the atmosphere? Turns out the answer is no, CO2 is on the order of 19 percent, and water vapor is also about 29 percent. This is very, very different from the concentration in the atmosphere. Stated another way, 19 percent is the same as 190,000 ppm. So, the concentration of CO2 is much, much higher in a furnace. What else is different? For one thing, the temperatures are much different. CO2 in a furnace is glowing, white-hot. Its temperature is on the order of 1800 degrees F. Yet, in the atmosphere, CO2 is on the order of 90 degrees F down to - 40 degrees F. I wondered if that made a difference, and if it did, how much? The basic answer was that yes, CO2 and water vapor each absorb radiant heat and re-emit that radiant heat. So, there appeared to be some valid basis for the scientists’ claims that CO2 absorbs heat. But still, I wondered. I then read some more in the scientific literature and found that CO2 only absorbs a small fraction of the radiant heat leaving the Earth’s surface. A very, very small portion. Not only a very small portion, but the effect of adding more CO2 to the air has a diminishing effect on how much radiant energy is absorbed. In effect, the atmosphere’s radiant absorption is the same whether CO2 is present, or not. The effect is further diluted because water vapor also absorbs radiant energy at the same wavelengths as does CO2. Water vapor also absorbs radiant energy at other wavelengths, but there is an overlap with CO2. So, I sat back and pondered over all this, gave it a good thinking through. The Earth, as I knew, cooled off rapidly and substantially in the clear desert nights, even in the heat of summer. The cold desert nights are attributed to the very dry air, that is, almost zero water vapor. This effect is pretty amazing, and one can actually see ice form in a shallow pan at night in the desert when the surrounding air is above freezing. This is a favorite event for Scouts who go desert camping. One takes a shallow pan, such as a brownie pan, puts about a quarter inch of fresh water in the pan, and sets the pan down on some insulating material such as Styrofoam or cardboard. We wrapped a dry towel around the sides, too, to keep the air from warming the pan. Sure enough, just before sunrise, we checked and there was a layer of ice on the water surface. Enough heat had escaped from the water via radiation into the black sky above, unimpeded by CO2 or water vapor, to allow the water to chill and create ice. The ice water was great for filling canteens. Yet, one cannot do this at night in a humid climate, such as Houston, Texas where I grew up and also did some camping. The water vapor in the air, even on a clear night, prevents this. So, I wondered and pondered the entire question of CO2 absorbing heat in the atmosphere. First, the Perry’s handbook made mention of a most important parameter, the “mean beam length,” or MBL. This refers to the distance from the hot CO2 and water vapor gases to the furnace tubes where the liquid is contained that must be heated. The greater the distance, the less impact the radiant energy has. This is rather obvious from everyday experience, also, if anyone has ever built a campfire or lit a candle. Closer to the flame is much hotter, and far away from the flame is much cooler. This is common knowledge, except among very young children. This is also well-known from the planets in the solar system, with planets closest to the sun being very hot such as Mercury, and those farther away growing colder and colder. Yet, the Sun’s surface is the same temperature. Clearly, distance has something to do with the amount of radiant energy absorbed. I wondered just how much energy CO2 could absorb at altitudes of 10,000 feet, 20,000 feet, 30,000 feet, and higher. Also, as the atmosphere grows thinner and thinner with altitude, I wondered how many CO2 molecules are present at each altitude to absorb whatever heat energy happens to be passing through. It was rather obvious that even ancient man knew some of these basic facts, as references to “the cold stars” are common in literature. Yet, we now know that stars are in fact suns, and some of them are much bigger and far hotter than our sun. We cannot feel the heat from them, due to the very great distances measured in billions of miles, if not trillions. Far away means very cold. Up close means very hot. I had not yet formed a conclusion, a firm opinion, on all the scientific claims of CO2 causing the earth to warm, but it was looking pretty shaky to me. Then I considered my engineering background in process control, and kept thinking about campfires. The Law of the Campfire is simple, and was stated briefly above: if you are too hot, move back. If you are too cold, move closer. Closer is hotter, every time, for a campfire that has constant heat output. And yet, I had seen the chart that showed CO2 was slowly rising, a nice smooth curve. At the same time, the average temperature for the entire earth had peaked in about 1940 and decreased for 35 years. Then, the trend reversed, and the earth started warming again. That is impossible, if CO2 is what is causing the warming. For CO2 to cause the earth to cool for 35 years, then warm again for the next 35 violates the fundamentals of process control. A noted PhD chemical engineer, Dr. Pierre Latour, wrote on this same subject in a familiar magazine, Hydrocarbon Processing. I had my own blog by then, and wrote an article discussing Dr. Latour’s writings. For CO2 to allow cooling then warming, would be like moving your chair closer to the campfire to cool down on some occasions, but moving away to cool down on other occasions. I knew right then that CO2 could not do what the scientists say it does. Not at those low concentrations in the atmosphere, and not at those low temperatures. But, I wanted to look further, so I kept reading and questioning. About that time, November of 2009, the Climategate scandal broke when thousands of emails and computer files were released into the internet. The files were incredibly damning, and damaging to the climate warmists’ cause because they revealed improper actions by some of the scientists at the heart of the climate debate. In damage-control mode, the scientists at the Hadley Center’s Climate Research Unit of the University of East Anglia, UK, chose to release some of their files on temperature records for about 1,000 locations around the world. The intent was to show that there was nothing to hide, and in a good faith effort, here was the raw data for all the world to see. I copied the files onto my computer and had a look. First, the so-called raw data was anything but raw. I know raw data, having acquired reams and reams of raw data as a practicing chemical engineer, in refineries and chemical plants all over the world over more than 20 years. What HadCRU (Hadley Climate Research Unit) had released was processed data. Their release showed the average monthly temperature over a period of several decades for the chosen cities. The monthly average was created from the daily average temperature. The daily average was created by averaging the high and low temperature for the day. The high and low temperature were each sometimes adjusted, or fudged, by accounting for the time of day for that temperature reading. Also, there was no indication of how missing data was replaced or created. Instruments are not 100 percent reliable, and sometimes require attention. They may require cleaning, calibration, parts replacement, or other servicing. They may be out of service for a period while someone notices the data is missing and fixes the instrument. Yet, here was a data set of monthly averages for about a thousand cities. I decided to look at what was there, for the USA. There were 87 records, all in the lower 48 states. The data were for cities all across the USA, not in every state, but in most states, and were fairly evenly distributed. Some were in great cities like New York, Los Angeles, San Francisco, Miami, some in mid-sized cities like St. Louis, Spokane, and Fresno. Others were in small cities or large towns, like Abilene, Texas, and Meridian, Mississippi. I loaded the data for each city into a popular spreadsheet and made graphs of the monthly temperature versus time. I included a moving average to see what trends were apparent, if any, then added a linear best-fit trend line. The results were so fascinating that I uploaded all the graphs onto my blog, with some commentary. What I found confirmed what I had suspected all along. CO2 cannot do what the scientists claim it does. 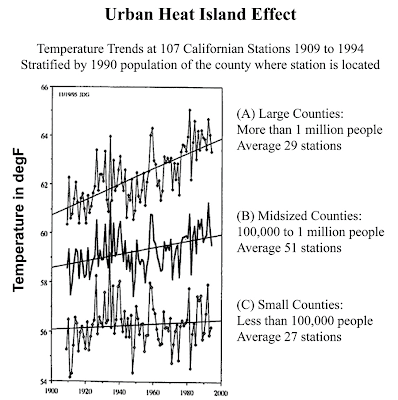 What the graphs showed was a terrible inconsistency in the warming of cities in the USA. Some cities did, indeed, show a pronounced warming trend over a roughly 100 year period from 1900 to 2009. Not all cities had data that extended that far back, though, as only 62 had long-term records. Yet, other cities among those 62 had cooling trends, or neutral trends. That seemed odd, because if CO2 was truly warming the earth, then it must be warming every part and not being selective about what to warm and what to ignore. This is especially true for adjacent cities, or those not separated by great distances north to south. There would be some difference, supposedly, for cities in the far north compared to those near the equator. But, the USA is only about 1500 miles from north to south in the lower 48 states. For the earth’s total distance from pole to pole of approximately 12,000 miles, that is barely more than 10 percent. For cities that are only one or two hundred miles apart, it seemed very odd to me that CO2 would ignore one and focus its heating rays on the other. Physics does not work that way. If a phenomenon is truly a physical effect, it works consistently and equally at all times and places. Gravity, for instance, has the same downward force in Houston, Texas as it does in Mumbai, India, or Bora Bora. One can imagine the confusion if travelers had to adjust to different gravity effects depending on what city their plane had landed in. No, physics does not play whimsical games like that. Or, one could imagine how chaos would reign if the properties of steel were capricious, like CO2. Engineers might be building a bridge in Cairo, Egypt, and require hefty steel beams 12 inches wide and 24 inches deep. But, an identical bridge across the Mediterranean in Rome would require lighter beams of only 4 inches width and 12 inches deep. Engineers will laugh at this, because that simply does not happen. A given grade and quality of steel will hold up the identical weight, no matter where in the world it is used. Purists will note that this is not strictly true, as steel is somewhat affected by temperature. But, for most purposes, bridges do not get hot enough to weaken the steel noticeably. At this point, I looked at adjacent cities and noted that some cities, as I wrote above, showed a cooling or neutral trend. Abilene, Texas, and Shreveport, Louisiana are two of those. Abilene shows a slight cooling of 0.19 degrees C per century, while Shreveport shows a very slight cooling of 0.01degrees C per century; essentially no change at all. These cities are only approximately 250 miles apart, east to west. They are at essentially the same latitude. At the same time, St. Louis, Missouri, shows a warming of 1 degree C per century. St. Louis is only approximately 300 miles north and a bit east of Shreveport, and approximately 400 miles from Abilene. Clearly, something is amiss in the CO2-causes-global-warming science. How could CO2 know to ignore Shreveport, but focus its beams on St. Louis? Another example came to my attention: San Francisco, California, and its neighboring city, Sacramento. These cities are separated by only about 50 miles, and nearly at the same latitude. Yet, San Francisco had a warming of 1.5 degrees C per century, while Sacramento cooled by 0.3 degrees C per century. 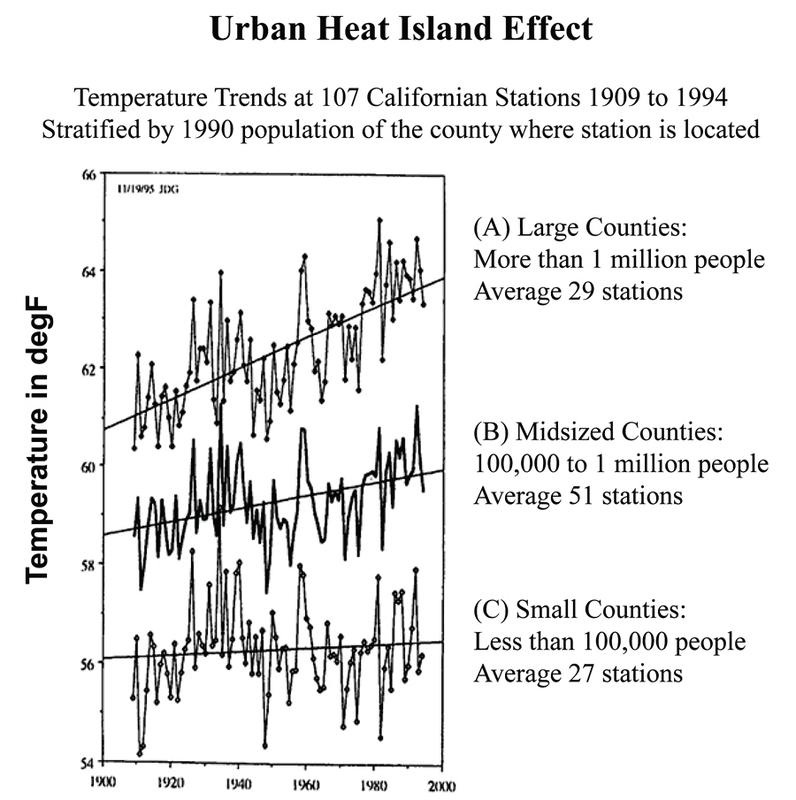 One possibility that explains the heating versus cooling or no trend is what I learned was called the Urban Heat Island effect, or UHI. At first I thought this referred to the University of Hawaii until I finally found what the acronym spelled out. UHI is a phenomenon that causes cities, or large urban areas, to be hotter during the day, and warmer during the night, compared to more rural areas nearby. The UHI effect is small for small cities, but grows larger for large cities. The UHI is due to several factors, including expanses of asphalt and concrete paving, stone or brick or glass-and-steel buildings, great consumption of electricity to heat or cool the buildings, industrial heat from factories and other heavy industries, and large numbers of cars, trucks, buses, and airplanes that consume great quantities of fossil fuel. But, even UHI has problems. For example, Meridian, Mississippi is a small town and it is warming at the identical rate as the large city in Texas, San Antonio. Both show a modest warming of 0.26 degrees C per century. How can that be, if UHI is important? Other small cities show substantial warming, such as Helena, Montana and Duluth, Minnesota, at 2 degrees C per century. Duluth’s population hasn’t changed much from around 80,000 people since 1930. It reached 107,000 in 1960 but has been decreasing since then. Helena has grown from about 12,000 in 1910 to 28,000 in 2010. I want to turn briefly to the amazing small town of Eureka, California. I have never been there, but it is on the coast in northern California between San Francisco and the Oregon border. When the winter Olympics are held near 2075, Eureka should put in a bid as the host city. It will soon be covered in snow year-round, and may have a localized ice age if the present cooling trend does not reverse. Eureka has, starting in about 1990, had a cooling trend of approximately 15 degrees C per century. Its average temperature currently is about 10 degrees C, so in 65 years the average temperature will be zero C. One can only wonder why CO2 has ignored the small town of Eureka. If any town needed some global warming, it would be Eureka. Finally, my attention was turned to a published study by Dr. James Goodridge, the former state climatologist for California, now retired. His work showed that California’s counties could be grouped in three groups according to population, and the average temperature trend for each group computed. He found that counties with large populations showed a distinct increasing temperature over 80 years, while those with small populations showed essentially no warming at all. The mid-sized counties showed an intermediate amount of warming. One must seriously question how CO2 did that, in a state as geographically large and diverse as California. The large population counties are typically on the coast, with the cities of San Diego, Los Angeles, and San Francisco. Small population counties are all across the state, including on the remaining coastal areas. It is highly unlikely that CO2 is smart enough to pick and choose which counties in California will receive its warming beams, and which counties will be ignored by CO2. To summarize the journey to this point, then, I found that scientists claim the earth is warming at an alarming rate, but there was a previous warming of equal magnitude and duration (1910-1940) during a period when atmospheric CO2 was at low concentration. Also, the earth stopped warming and cooled a bit from 1940 to 1975, then started the warming again. For CO2 to cause a warming, then a cooling, then a warming again is impossible and violates the fundamentals not only of physics but of process control. Finally, CO2 ignores completely some cities in the USA, indeed entire counties in California, while warming adjacent cities and counties with large populations at an alarming rate. CO2 is a simple molecule with one carbon atom and two oxygen atoms, and cannot possibly be that smart. All the above was more than enough to convince me that the threat man-made global warming is false, it is a hollow threat, and has zero substance. Yet, if one reads the policy summaries and scientific studies, the premise is that CO2 causes warming and more CO2 causes more and faster warming. All else follows from that failed premise. Still, there is more to the story. I want to describe what I found when I looked at the temperature record itself, the one that shows a warming from 1910 to 1940, a cooling from then until 1975, then a warming again until about 2000. To preface this, it is important to know that in engineering data collection and analysis, indeed in any scientific data collection and analysis, it is only rarely appropriate to go back and change one’s data. It is extremely inappropriate to change one’s data over and over again. That requires some explanation. The question is, how accurate is any data? The data here, for climate purposes, and whether the Earth is warming or cooling, is temperature data. Temperature data can be obtained very accurately and very precisely with modern technology. Not to get too technical with this, but accuracy and precision are not the same thing. Accuracy can be considered as how close to the truth is the measurement, while precision is the measure of how many decimal places are believable in the measurement. In the early days of thermometers, it was difficult to calibrate them and also difficult to obtain a reading within half a degree. Thus, the thermometer may have read 80 degrees on a fine sunny day but due to mis-calibration, the actual temperature was only 78 degrees. What is not known in many cases is when a thermometer broke and was replaced. It is also not known if the replacement thermometer was calibrated to read the same as the earlier one. Finally, if different observers read the thermometer, one may have judged the reading to be 70.5 degrees, while another would read it to be 70 degrees. These seem like small differences, and they are. However, the entire warming over the past century was said to be only 0.7 degrees C, or roughly 1.2 degrees F.
My attention was called to some amazing work by E. M. (Michael) Smith, who runs a blog titled chiefio.wordpress.com. The pertinent portions of his blog entries are known as The March of the Thermometers. Michael is rather a whizz at computer programming and data analysis. He accessed the publicly-available massive data and computer code used at NASA by Dr. James Hansen, known as the GISS code. I believe GISS stands for Goddard Institute for Space Studies. Michael unraveled the code, and wrote of his findings in several postings. The key findings were that the code re-writes the past data each time it is run. Also, the code makes questionable choices in how missing data is treated, and how discontinuous data is spliced together. Another and, to me, most important finding was that Hansen deleted major portions of the temperature measurement stations in recent years. That does not appear to be random but perhaps (likely?) was chosen in a way to show much more warming in recent years. 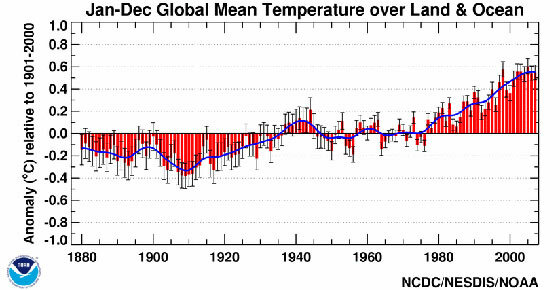 In effect, the temperature trend that results from NASA GISS is false. I highly recommend that anyone who is curious about the temperature history of the last 120 years or so read what E.M. Smith wrote about it. The past data is not only changed, it is changed frequently. If missing data is discovered, the computer code simply reaches out to an adjacent station that can be 1200 kilometers distant (about 700 miles!!!) and uses that data. Then, the entire system spits out a global average temperature based on anomalies from thousands of measuring stations around the world. Anomalies are another area for creating great mischief. The problem lies in having some cities in cold locations, and others in warmer locations. What climate scientists do is assign each month an average temperature, based on some pre-determined period of about 30 years. Some use 50 years, though, for reasons not clear to me. Further, the base period is not the same but is updated every ten years or so. Again, moving targets with constantly-adjusted data. It reminds me of the ancient three-shell game with the pea, where the mark tries to keep his eye on the shell that has the pea under it while the con-man shuffles them all around. The use of anomalies supposedly allows one to merge or blend temperature trends together without concern over where the average temperature was 5 degrees (Alaska) or 25 degrees (Bora Bora). Still, it is quite disconcerting to see yet another opportunity for data manipulation. A better method, in my view, is to obtain the data trend for each decade, for each station. If the station showed a warming trend of 0.1 degree per decade, then that 0.1 goes into the averaging pot. There would be no anomalies, no base periods, no changing base periods every 10 years, just a simple, one-time calculation of the decadal trend. That decadal trend would then be golden and not subject to change. Another very disconcerting revelation was the excellent work by Anthony Watts, who was mentioned earlier in connection with his blog, Watts Up With That. Anthony also performed a heroic task in assessing the vast majority of the USA’s climate measuring stations. His assessment focused on how well or how poorly each station was situated, or sited, according to the existing guidelines. For example, a well-sited station must be a certain distance from trees, from buildings or other structures, must be placed at the correct height over a grass area, and not be subjected to artificial heating or cooling measures such as an air conditioning exhaust. What Anthony found was appalling. He wrote up his findings along with several co-authors and had a paper published in 2011 (summary here). Many stations ranked as the poorest rating, and only a few had the best rating. Some were indeed mounted next to brick walls, on asphalt parking lots, next to air conditioner condensers, next to barbecue pits, on asphalt rooftops, at airports where they are heated by massive runways and jet exhaust, and other unacceptable locations. These are the sources of the temperature records for the USA, which is supposed to be the best and most accurate of any country in the world. Where the siting conditions become important is how the temperatures are affected over time, over a period of years. A rural setting would likely show lower readings in the early years, but warmer and warmer readings as buildings are built, roads are installed, parking lots are installed, and other such things. Thus, part of what Anthony did was determine how much of any demonstrated warming trend was due to siting changes. There are a few more points, and I will finish. First, sea levels are not rising and oceans are not getting hotter. This alone disproves the entire CO2-induced global warming nonsense. By the warmists’ belief, the oceans must grow warmer, and the sea levels must increase as CO2 increases. Neither is happening. In fact, the opposite is happening. NASA and NOAA’s own data show this quite clearly. 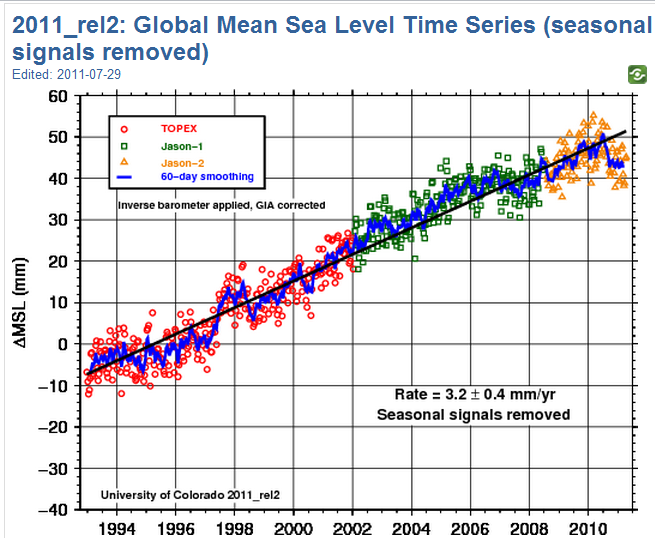 The chart below is from U. Colorado, and is based on NASA's satellites that measure sea level. 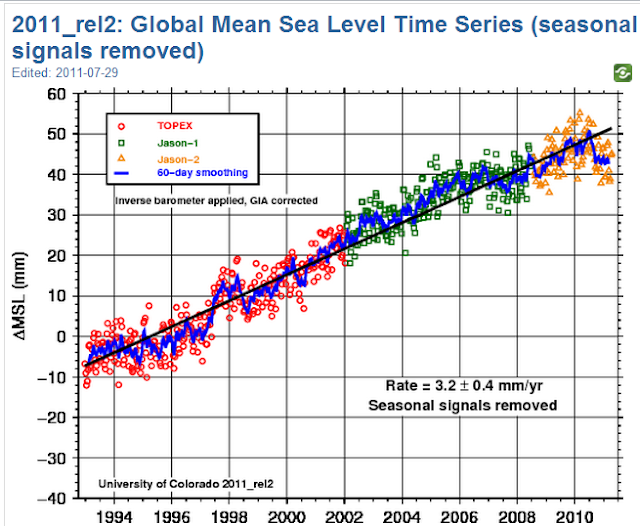 Note on the chart the dramatic decrease in trend starting in about 2005, and the sudden decrease in sea level in early 2010. 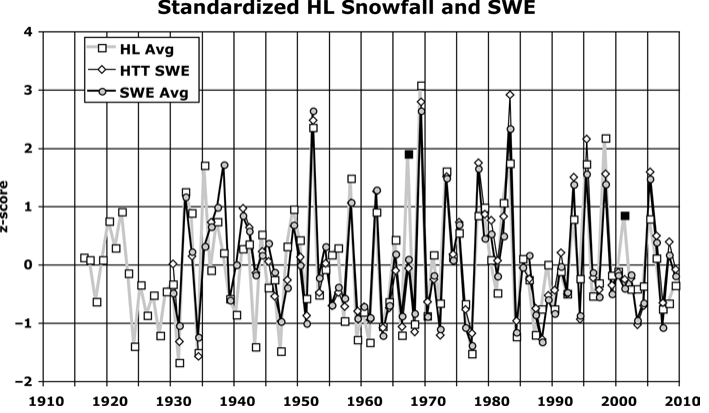 First-part B, Sierra Nevada snowpack and snow-water-equivalent (SWE) have not changed significantly in almost 100 years. Dr. John Christy of University of Alabama, Huntsville, published a paper on this in 2010. His data ended in 2009. Since then, there have been near-record snowfalls in the Sierras. His key graph is shown below, normalized to show deviation from the average. From his paper, HL refers to a key snow measuring station, Huntington Lake. The paper is at this link. Second, a recent peer-reviewed paper from CERN shows that clouds and sunspots are related, with the 20th century having great sunspot activity, but the little ice age had few to zero sunspots. Recently, in the last 4 years or so, our sun has again gone suddenly very, very quiet and it is getting cooler. The lack of sunspots came as a complete surprise to scientists all around the globe. The relationship is that more sunspots equals hotter climate. The mechanism is that the sun’s magnetic field is immense, and grows larger and more intense as sunspot activity increases. The magnetic field shields the Earth from Galactic Cosmic Rays, GCRs. However, when GCRs hit the atmosphere, they create cloud nucleation particles and more clouds form. More clouds reflect more sunlight away from the Earth, and cooling occurs. Once again, more evidence that the science is not settled. Heck, they cannot even predict how many sunspots, nor when they will occur. The CERN experiment and published paper was only a few weeks ago. Third, climate models cannot agree, and their projections do not match the satellite measurements. This shows that the science is far from settled, and when a model fails to match the measured data, the models are wrong and must be scrapped or improved if possible. A very recent paper by Spencer and Braswell has caused an uproar in the climate community because it shows very clearly that the climate models are far off in their predictions. The satellite data doesn’t match the models. Fourth, hurricanes are not growing more intense and in greater numbers. In fact, hurricane energy is at a historic low for the entire period of satellites. Meanwhile, CO2 continues to increase. Another busted prediction, proving their ideas are totally nonsense. The chart below, from Dr. Ryan Maue of Florida State University, shows the current status of the world's tropical cyclones measured as Accumulated Cyclone Energy from 1972 until today. The top line is the total for the world, the bottom line is for the Northern Hemisphere. The total cyclone energy is back to what it was in the middle 1970s, and meanwhile CO2 continues to rise. Fifth, and finally, the only prediction the warmists have correctly made is the continual reduction in the Arctic ice cap. However, they have the cause and effect completely wrong, for the following reasons. First, the warmists maintain that a shrinking ice cap is strong evidence that the Arctic area is warming, and that warming is due to the heat rays beamed down by CO2 in the atmosphere. In reality, ice acts as an insulator and prevents heat from being released from the ocean into the night sky via radiation. Ice acts in a similar way on lakes, it keeps the lake from freezing solid unless the lake is very shallow. The growing and retreating Arctic ice acts as a negative feedback on the ocean’s heat content. When the oceans are warm, the ice begins to melt at the edges. There is thus more open water that loses heat due to radiation. The ice extent is at a minimum usually around mid-September, which allows great amounts of heat loss in the long polar nights. The oceans then cool, which eventually cools the air, and allows more ice to form in future years. The system oscillates then between more ice and less ice, with the ocean temperature and heat content also oscillating but slightly out of phase. In conclusion, if anyone still believes that CO2 does what scientists claim it does, I suggest you think about that the next time you are at a campfire, or near a candle, or any other fairly stable heat source. Move toward it, then move back. Also, find a nice masonry wall that has ample sunshine on it. Just after dusk, when the sun is no longer shining on the wall, place your hand on the wall and feel its warmth. Then, move slowly away from the wall and see how long you can continue to feel the warmth. Think about that little CO2 molecule, having to also feel that warmth, get all excited, absorb the heat, and then re-radiate the heat back out again. Remember that scientists insist that the Earth warmed from 1910 to 1940 - yet CO2 was very, very low. Also, have a look at Anthony's blog and E.M. Smith's blog. Think about this: if the science is settled and we must act now or lose the Earth's future to a hell of warming, rising oceans, monster hurricanes and all the rest, why did the CERN experiment show that clouds are far more important than CO2? Why do the satellite temperature measurements show the models' predictions are all wrong? Why has nothing ever panned out for the climate warmists? The only thing they can point to is the declining ice in the Arctic, but as I discussed above, they have that completely wrong. Finally, have a look at the temperature graphs of the USA's cities on SLB. See for yourself how many, many cities have zero warming or a slight cooling. Then, ask yourself how can that be? How did CO2 get so smart that it can selectively ignore some cities? CO2 is innocent. It always has been, and always will be. A fascinating and impressive post, Mr Sowell. It must have taken a long time to write but would bear reading by anyone interested in this field because it explains in common-sense terms the problems you have identified with so much of the "official truth" that is asserted to be "settled science". Mr. FB, thank you for the kind words. I wanted to create a post where I could respond to the argument put forth by the AGW side: "There are multiple lines of evidence for AGW." Here, I tried to show there are multiple lines of argument against AGW. Also, to believe in AGW, one must disavow the very core of engineering and process control. If I have to choose between AGW on the one hand, and engineering plus process control on the other, AGW loses. World-wide, millions of bridges stand up in mute testimony to the strength of the engineering argument. Our airplanes fly as a testament to process control. Our refineries, chemical plants, steel mills, and power plants run 24/7 also as testaments to process control, and engineering. Even persons camping, who can be observed moving closer to or farther from a campfire, provide testimony to the authority and reality of process control. The unproven premise of AGW has only computer models that do not match the observed data. Wishing it were so does not make it so. Not to an engineer, nor to the attorney who advises and represents him. Excellent article. Good writing, sound science, impressive research, useful. I recommend it to every high school sophomore on Earth. Skepticism is central to learning. Pierre Latour recommended I read your posting. I'm glad I did. Yours is among the best analytical summaries of the key issues concerning the science of 'man-made global warming' I've read to date. Thanks for your post its very informative. Roger, that was a fascinating read. Would it be possible to get this more widely published, perhaps in one of the serious monthly journals? I've come to the conclusion that many of "the team" aren't all that bright and have been promoted beyond their abilities. Why else do they refuse to engage with intelligent sceptical people. "I wanted to create a post where I could respond to the argument put forth by the AGW side: "There are multiple lines of evidence for AGW." Wow! great article -- clear, concise and convincing! The only fault I see in it is one minor typo in your phrase above, "multiple lines of evidence for AGW." I think you may have accidentally included an extra letter "n" in the correct word, "lies." Antonia, on Feb 6, 2012, thank you for the kind words. I would be pleased to have this published in a journal, if the copyright issues can be resolved for the various graphs. The use in this blog article constitutes Fair Use under the US Copyright laws. Brilliant article, Roger. Always stimulating to read such thorough, evidence-based argument, rather than assumption-based propaganda and modellers' fantasies. I've been reading about "climate science" for about 20 years now and surely the house of cards must soon collapse. Given Phil Hughes's recent admission that there's been no warming for more than a decade (echoing his Climategate email admission) perhaps it already has. Excellent article and very well written, Mr. Sowell. I have tried to explain these same points to others with some success. It would be great to see this published in a MSM newspaper or magazine. I wanted to record that I found this blog entry as a result of reading a reference to AGW, and thinking "what the heck is AGW?" I googled the term, and found several references, including one to your article. Your article provides detailed information and logic. I like the openness to truth and the willingness to discuss specific models. The question of climate change, particularly man-made effects on climate change, and whether such changes, if any, are worth correcting, is a scientific question and not a political one. I think a lot of the discussion illustrates a corollary to Parkinson's Law, which is that people focus on things they can easily understand, even if there is a far more important issue which is being ignored. Unfortunately, the parameters of modern discussion seem to ignore issues that require thought and research to approach intelligently. Thanks for your article, which is long to read, but detailed, logical, and which gives your reader a solid basis for looking at articles attempting to convince the reader that climate change exists, or worse, attempts to ridicule people who disagree with the hypothesis. As a retired structural engineer, I thoroughly enjoyed reading your post. The alarmist community seems bent on ignoring science, physics and, I guess, common sense, to desperately cling to an idea best left to fantasy. As a hobby astronomer also, the Sun's activity has always made more sense as a climate driver. Good work and God speed.